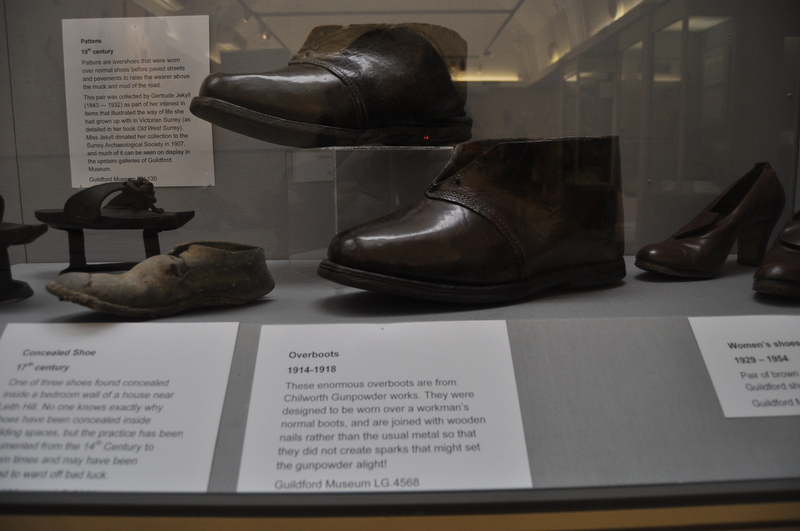 Yesterday at a museum I saw an exhibition of historical shoes. I took photographs of some old industrial overshoes, completely ignoring what stood next to them: a small pair of shoes found concealed in a building in Guildford. I had forgotten how bewitching are concealment shoes, so I dug this post out to remember them by. My daughter had a little pair of white shoes. They were the best money could buy, made of soft leather and trimmed with little garlands of blue flowers. Maddie wore them when she was three, for her cousin’s christening, and thereafter she wore them with every pretty dress in the dressing up box. She, and we, loved them. Such pretty little things. I am gifted as neither archivist nor curator. When the shoes became too small, we moved and one was lost. Faithfully, and for posterity, her grandmother held on to the one which was left. About a month ago, Phil helped his mother clear out the loft . And what should we find, but the other shoe. A shoe is better than a snapshot. It is the most concrete reminder of someone.Perhaps that is why, for hundreds if not thousands of years, this is the object people choose to hide in the fabric of buildings. I know about this because of a lady called June Swann. A world-class specialist in historical shoes based at Northampton Museum for 48 years, even after retirement she consulted nationally and internationally to hallowed institutions like London’s Victoria and Albert Museum. in 1957, Ms Swann made an astonishing discovery. She was talking to the head of Northampton Technology College’s Boot and Shoe Department, John Thornton. Together they realised that each had been sent, independently, seven shoes on seven separate occasions, for identification. Most had been found in chimneys. They were on to something. By 1995 the total number of concealed shoes was more than 1100. They have been hidden in everything from a humble cottage to a great cathedral, with several town halls graced. The shoes are invariably well worn and patched. Shoes have always been expensive – at least a week’s wages – and people did not part with them lightly. They are found in fire places, by windows and under floors to name but a few locations. Swann meticulously sets out the facts of the practice of concealing, from proportions of each kind, to locations, to anecdotal evidence that this was just something builders did, as a matter of course. And she includes one very strange story. David Papilon was a well-off young man. He moved into Papilon Hall, Leicestershire, in the first half of the 18th century. He was a magnetic character by all accounts: but, the story goes, he seemed to have hypnotic powers: and the local villagers were terrified of him. It seems he kept a mistress. ‘Kept’ is the operative word. For the Spanish beauty is said never to have been allowed out of the hall; only to take exercise on the leaded roof of the great house. She died in 1715, but there is no record of her death; or indeed, of where she was buried. On her deathbed – however that was arrived at – she is said to have laid a curse, intricately interwoven with her shoes. She vowed that catastrophe would befall anyone who tried to remove the shoes from the house. Ever since , when the deeds of the house were handed on, so were the shoes: one pair with green and silver brocade, and a pair of red clogs with silver embroidery. In 1866 someone forgot this little detail and the house was filled with unexplained phenomena. Terrified, the incumbent family brought in the vicar, who traced the shoes, and had them locked behind an iron grille high up on the wall in the house. The shoes went off to a Paris exhibition in 1878 and there was a repetition of events. The shoes were hurriedly returned. And so time marched on. Sir Edwin Lutyens remodelled Papilon Hall in the early twentieth century: the shoes were removed and the trouble started once more. During the alterations, in 1903, a skeleton of a woman is said to have been found within the walls. The shoes live in a museum now. I wonder how the house is faring? We all have a pair of favourite shoes: and our deepest social memory tells us they are something exceptional. A journal of our lives, wrought in leather and broken in by a rounded life. That favourite pair of yours: where will they turn up next? Posted in Quirks of History, Spine ChillersTagged concealment shoes, fashion, ghost stories, history, shoesBookmark the permalink. I have a pile of old shoes in my garage. Some of them I wear while working in the yard, but others I keep because they bring back memories. When I saw the title of your post I thought of shoes that were made to conceal deformities. I like the actual subject better though. Really interesting story. I had never heard of shoes being concealed in houses, but I have heard of a lot of other treasures being found in walls of old buildings..
Not long till Hallowe’en now, Julie! Wow, didn’t know any of that stuff and you gave me the chills again! I was just looking at a little pair of my boys first shoes the other day – such memories. I think my wedding shoes would have been a good keepsake if I had not lost them at the reception – haha! (maybe someone helped themselves to a souvenir). Shame on them if they did, making the bride walk home in Doc Martens. (My fanciful imagination coming in there…) As you say – shoes really do hold the memories well. BBBRRRR,,,Shivers for sure this morning reading about the curse. I go through running shoes fairly quickly and they then become yard work shoes before being retired to that great garbage dump in the sky. I have never kept a pair of shoes to hide in the house, the thought had never even occurred to me until reading your post. Maybe we’ll hang a few pairs on the front porch for Halloween this year, that will be pretty spooky. Marco Polo wore out whole lotta shoes. Going by boat as Columbus suggested was cost effective. I no longer wear them because I don’t trust myself on heels, even though these heels are only about 1 1/2 inches high. They have straps at the back–I like strappy sandals!!!! and they are bronze in color. I tell you just thinking of them brings back my youth to me. I’ve become, I think, staid and matronly. I used to be like those shoes! Bold and brassy! Thanks for reminding me of them. Peace. Lovely description, Dee, I can hear how many memories they hold for you. I love the thought of a Spanish vixen, haunting a house through her shoes. Do you know, Andra, I had a feeling you would…. The only concealment shoes I’d heard of – until now – were Rosa Klebb’s poisoned stiletto in the toe of her shoe in the James Bond movie,”From Russia With Love,” and Maxwell Smart’s shoe with a phone hidden in it. Kate, your story of revenge from a kept woman is chilling and fascinating. Isn’t it? It’s amazing what one stumbles on in one’s travels, Judy. These stories lie around waiting for the discovering. I loved reading this again, Kate, and the whole idea of concealment shoes is rather fascinating. My shoes hardly ever wear out, so I’m not often fashionable nor would I wear the heals that are so “in” these days. I DO have a pair of boots, cowgirl boots, that I wore when I was about 5 or 6 years old. They cowgirl outfit is with them, now a little worse for the wear, but, still in one piece. Jennifer wore it when she was 5 for Halloween. Hmmmm . . . wonder if a certain little miss might want to try them on for size soon? Excellent tale as we inch closer to Halloween Kate! I don’t know if concealment shoes happen here in the states, but when I moved into my apartment almost 30 years ago, I did find two bottles of unopened Heineken. I welcome concealment beer. Does it improve with age, Lame? I might stash a few Becks bottles in with the cavity wall insulation ready for my retirement. I don’t recall it tasting skunky. Concealment Shoes! I’ve never heard of this before, and it’s amazing to me. What a story! I’m not nearly as fond of shoes as many other women, but they can be sentimental. I had my children’s baby shoes bronzed and made into book ends. Sentimental AND practical. LOL! I’m intrigued with this post, Kate. And now I’m wondering what my children will think one day if they find their mother hid shoes in the attic! I love the book end idea, Debra. What a brilliant way of saving up all those memories. As you say: sentimental and practical. From baby shoes to kept mistresses to curses and spells to skeletons lurking in the walls of halls . . . . The perfect post for All Sole’s Day. I had never heard of concealment shoes before, but there was a movie called The Red Shoes in which ballet shoes seemed to possess a curse. As I remember it, the shoes compelled the ballerina to dance, and finally, to jump to her death. Those shoes were scary. I know this is off the subject, but parallel. If you take rocks from the Hawaii volcano without asking permission from the fire goddess Madame Pele, you will incur untold troubles. Many have actually mailed those rocks (and shoes covered with volcanic dust) back to the Volcano Park museum to get rid of the curse. I love The Red Shoes, Jennifer: it’s one of my favourites. The rocks piece of folklore is amazing! Ooh, creepy. Lovely. And another germ of a perfectly delightful novel. I know of a renovated building where shoes, among other small items were found in the footings! I have no idea. Gut feeling is that is was something a little darker than luck. But maybe I’ve been watching too much Wicker Man. OMW quite fascinating stuff..All in a pair of shoes..who would have thought!! I know. It’s amazing what a simple line of inquiry will turn up, Lisa!